Pike Blog: Mad like me? I love it when you can look out the window on a frosty morning, from your nice warm house, cup of tea on the go and a snuggly cat on you lap and realise you don't have to leave the house all day... Then you think I'll go roach fishing, fishermen are a mad bunch! This morning I made a spur-of-the-moment decision to go after some Wandte roach, so I set off into the cold armed with a few slices of bread and a quiver tip. 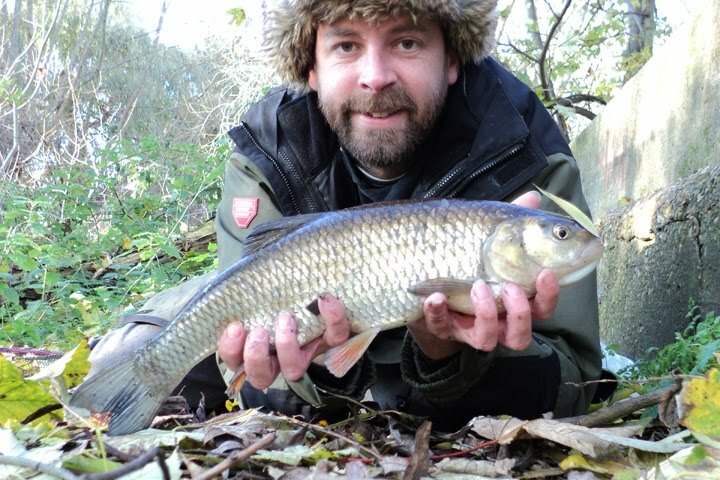 I snuck into the swim I caught the five pound chub in last week and the first cast met with a good bite and a 3lb 3oz chub. I did everything I could to minimise disturbing the swim, I'm even lying down in the photo - so I wasn't surprised when the next cast resulted in another good bite. This time I hooked a large pair of white trousers! After pulling these through the swim I knew the game was up.